The study of biogeochemical processes of ecosystems is important in understanding the interactions of aquatic biota with their environment and the response of aquatic ecosystems to both natural and anthropogenic disturbance. 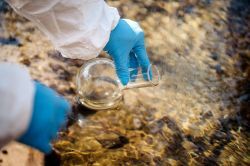 Our field-based research is conducted across a wide range of aquatic environments, from alpine headwater streams to lowland rivers and wetlands. This work includes the response of alpine peatlands to high flow (storm) events, seasonal drivers of water quality, wetland acidification and blackwater events. We also conduct laboratory-based research under highly controlled conditions in order to understand the interactions of biota with their chemical environment. Synchrotron-based X-ray absorption spectroscopy and infrared microspectroscopy.